Heya, Welcome. Are you looking for the best hiking offers to Mount Kilimanjaro, Tanzania? There are different routes to reach the roof of Africa. Let’s go one by one. In the morning after getting you breakfast you will be taken to the Kilimanjaro National Park gate (1,840 m). You might be lucky to catch a glimpse of the thumbless black and white colobus monkeys scrambling through the lush vegetation. Approximately 4 hours later, you will reach your destination for the day, the Mandara Hut. After a well-earned rest, your guide will take you to the Maundi Crater where you can enjoy wonderful views of the Kenyan interior. You will spend your evening meal and overnight stay at Mandara Hut (2670 m). This day continues through the heather to the edge of the short cropped moorland plains to Horombo Hut at 3,760m, from where Moshi township and the Pare ranges can be seen on a clear night. From the hut you will have fantastic views overlooking Mawenzi, Kibo peak and the Masai steppe. You will spend your evening meal and overnight stay at the Horombo Hut. After a relaxing breakfast, you will set off on a 2 to 4 hour trek to Zebra Rocks (3,980 m). The distinctive black and white stripes give the rock formation its name. On your return to Horombo Hut, a cooked lunch will be waiting for you. You can relax in the afternoon and regain your strength for the hike the following day. You will spend your evening meal and overnight stay at the Horombo Hut. Today’s destination is Kibo Hut and it should be reached in about 5 to 6 hours. 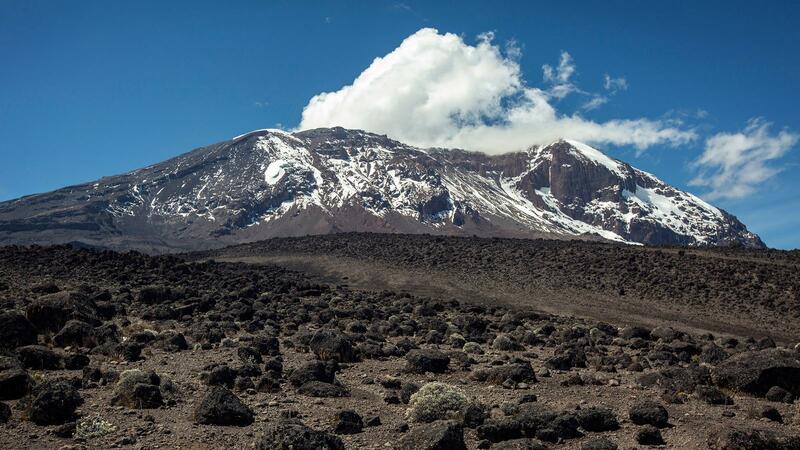 This stage is long and tough and you will pass plantless plateau which links the summit of Kibo with Mawenzi. You will start the journey in the middle of the night when the lava ash is still frozen and walking on it is easier. You will begin the long and strenuous trek to the summit in the dark. Passing the Hans Meyer cave at 5,200 m, the climb slowly but surely goes upwards. At sunrise, you will reach Gilman’s Point (5,715 m) on the crater rim. Soon you will have forgotten the cold of the night and after another 1 to 2 hours, you will reach Uhuru Peak at 5,895 m. The descent follows the same path and the lava ash will now have thawed and allows for a fast descent. On your return to Kibo Hut, a warm meal awaits you and you can rest a while to regain your strength. After the 1 to 2 hour break, you will be on your way down to the Horombo Hut (3,700 m) where you will arrive in the afternoon. The evening meal as well as overnight will be spent there at Horombo lodge. The last stage passes through the heather and moor zone to the Mandara Hut (2,700 m) where a cooked lunch awaits you. Soon you will again be in the lush tropical rainforest and after about 6 hours of trekking, you will be back at the Kilimanjaro National Park gate (1,860 m). After your arrival at Kilimanjaro National Park you will be taken back to Moshi town. 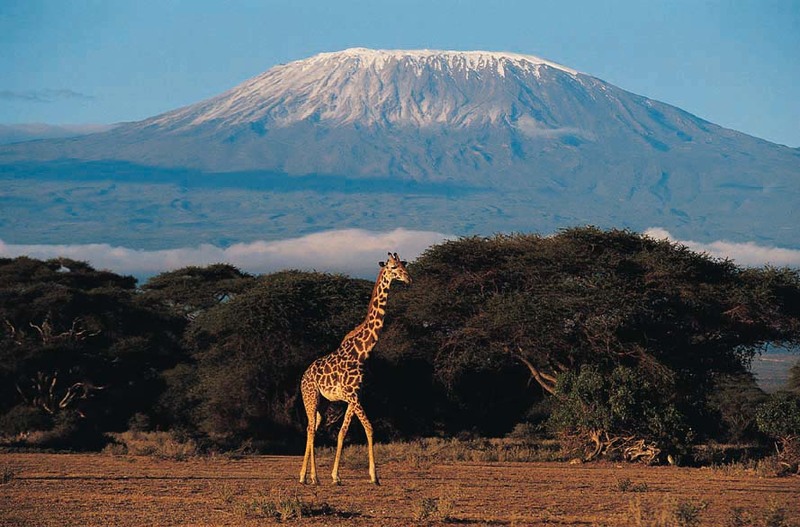 7 Day Mount Kilimanjaro trekking through Machame route – 1,798 USD per person. You will enjoy an enticing breakfast at the hotel before proceeding from Moshi to Londorossi Gate (1,800m). The three hour drive travels on an unpaved stretch of bumpy road through the town of Boma N’gombe and the Sanya Juu village offers motorists an intimate encounter with the natives. After completing the necessary park registration, you will be transported to the initial point of your trek at 2,350m. The glory of the forest is revealed in the illuminating radiance from the sun. Almond-brown trees stand serenely, brimming with a tender glow. Gems of amber encrust the bark exterior. Green canopies deliver shelter for the exotic blue monkeys. The short trek through the rainforest leads to the Mti Mkubwa Camp (2750m). As the trail begins to move towards Shira Camp 1, the scenery transforms dramatically from the lush rainforest to the barren heather moorland zone. The parched landscape is speckled with enormous lobelias, contrasting white fauna and flora and dusty sand dunes. We will journey up the steep ridges leading to the Shira Plateau, featuring the glorious views of the looming Kilimanjaro and the raging bloodshot orb of light slowly sinks beneath the horizon of Mount Meru in the west. We will cross several tranquil streams as we continue over the Shira Ridge (3,600m) and on a declining slop to Shira Camp 1. You will begin the day with a delicious breakfast and trek on an exposed moorland zone. This route is less frequented making it tranquil and untouched. Reaching Shira Plateau will reveal the stunning views of the peak of Kilimanjaro. The exhilarating sensation of witnessing the summit is magical. A hot lunch will be served at Shira Camp 2 (3,810m). Your guide will lead brief excursions for acclimatisation, afterwards you are free to relax. The Lemosho Route connects with the Machame Route before approaching the molten Lava Tower. The gentle incline leading to the Barranco Camp is encompassed in beautiful sceneries and encrusted in vivid desert shrubberies (6-7 hour hike). Shark’s Tooth is an enormous, serrated rock that a volcano discharged thousands of years ago, it is also an indication that we must travel south and cross the light valleys to the immense Lava Tower (4,600m). Specks of snow will gradually scatter themselves on the scenery and as we descend to Barranco Camp the frosted landscapes of the Western Breach will begin to sprout. The ashen Barranco Wall is engraved with extraordinary indents and olive foliage is strewn across the ‘Breakfast Wall’. The day commences with a simple trek up the astonishing Barranco (200m high). For a short period, you will need to use your hands and feet to scramble up the wall and upon reaching the surface you will have an opportunity to marvel at the scenic splendour of the vistas of Kibo. The trail traverses up and down with various shallow streams leading to the flickering, glittery streams of the Karanga River. An appetising lunch will be served at the Karanga campsite (3,930m). The short trekking will assist your acclimatisation. The rocky zone provides an uphill path that features landscapes battered in the crystal glow of the Southern Glaciers. Intersecting with the Mweka route allows us to witness the splendid vistas. A sixty-minute climb up a steep, rock strewn Lava Ridge is your ticket to the Barafu Camp (4681m). Reaching the camp signifies that you have dominated the Southern Circuit of the mountain and the enchanting, sky-piercing view of the summit is submerged in an ocean of clouds. The terrain at the campsite resembles an unfinished painting. The landscape is blanketed in a thin layer of snow with sparse vegetation. A substantial, warm meal will be served and we suggest that you jump into your sleeping bag as soon possible. We will embark on our journey to the summit at midnight. You will be awoken at 11:00pm and we will provide you with a light snack and a steaming cup of tea before you begin your 5km trek to the summit. This is an extended hike that lasts approximately 16 hours making this the most challenging day on the 8 days Lemosho Route. Temperatures typically range between -5°C and -10°C. The gradually increasing incline of the valley located near the eerily tranquil scree fields traverses amongst the Rebmann and Ratzel Glaciers – the view is so astounding that the freezing temperatures will be forgotten. At Stella’s Point (5,672m) brilliant gold and orange hues bleed like fire over the rocks. The first slither of the sun peeks over the skyline in a radiant, white form and the snow turns liquid gold and silver. After sixty minutes you will reach the highest point in Africa, Uhuru Peak (5,89m). You will have an opportunity to take some photos and marvel at the surrounding scenery, glinting ice cliffs and the jagged Mawenzi Peak. Our descent requires us to turn around and embark on the trail to Barafu Camp where we will have a brief resting period. The spectacular, vast plains of the Kilimanjaro are so enchanting that the 9km route to Mweka Camp (3,100m) feels rapid. The route is moderate and lasts four to five hours. As you venture on the declining rocky spree trail, the scenery will start to sprout and the ice will melt away. The barren landscapes of the moorland will be the first milestone, dense vegetation and exotic wildlife will begin to radiate as we approach the forest habitat. We will proceed to the campsite where you can scoff down a scrumptious, piping hot dinner whilst seizing the last opportunity to observe the Milky Way. The melodies of your porters celebrating will fill the air whilst you enjoy an appetising breakfast. The 1,300m descent to the Mweka gate is classified as an easy trek and will only last a few hours. Gold Summit Certificates will be awarded to every member in your group as a small souvenir. Our drivers are one relaxed stroll to the Mweka village away and they will transport you to the hotel where an invigorating hot shower, plush mattress and clean clothes await you. Kilimanjaro climbing, Rongai route in 6 Days is begins at the remote, northern side of Kilimanjaro, near the Kenyan border. We hike through a true wilderness area towards the jagged Mawenzi Peak, then cross a barren desert saddle, before climbing up Kibo’s eastern crater wall. The Rongai route is a more gradual ascent, and is therefore preferred by those with little or no backpacking experience, but is equally enjoyable for even the most hardened trekkers. Day 2: Rongai One (2,600 m); 3-4 hours walking. After breakfast transfer to Nalemoru rongai starting gate and after completing the necessary registration formalities at the National Park gate, The climb begins from Nale Moru (1,950 m) on a small path that winds through fields of maize and potatoes before entering pine forest. The track then starts to climb consistently, but gently through attractive forest that shelters a variety of wildlife, including the beautiful Kilimanjaro Colobus monkey. These monkeys are black with a long ‘cape’ of white hair and a flowing white tail. The forest begins to thin out and the first camp, Rongai One, is at the edge of the moorland zone (2,600 m) with extensive views over the Kenyan plains. Day 3: Kikelewa campsite (3,600 m); 6-7 hours walking. Day 4: Mawenzi Tarn (4,330 m); 3-4 hours walking. Day 5: Kibo campsite (4,700 m); 5-6 hours walking. Day 6: Horombo Hut (3.720); 11-15 hours walking. Day 7: Marangu Gate (1,830 m); 5-6 hours walking. A steady descent takes us down through moorland to Mandara Hut (2,700m), the first stopping place at the Marangu route. We then continue descending through lovely lush forest on a good path to the National Park gate at Marangu then after signing out transfer to moshi (1,830 m). If you wish to go for the Mount Kilimanjaro Trek, get in touch at worldthrougherica@gmail.com.